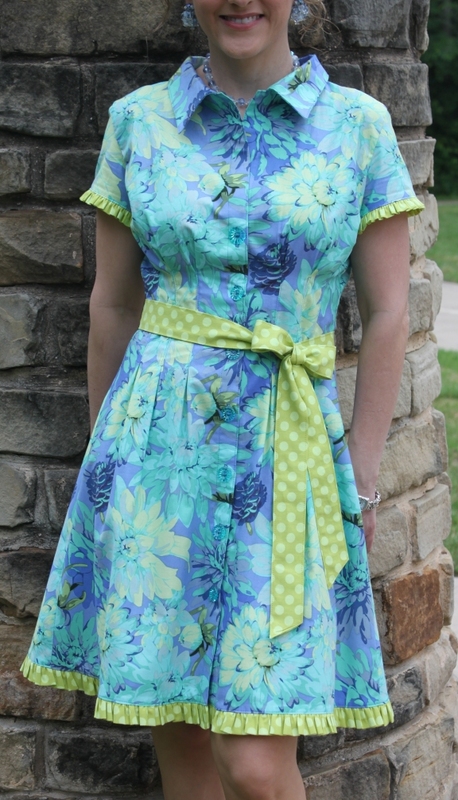 Sew Serendipity: New Spring Collection: Meet Sally! The second reveal of the new spring collection is the Sally Shirtdress. I love how this design came out! It was just as I had pictured it in my head and that is always a good thing. This is a classic shirtdress with a few twists here and there. The front and back are from one long piece, so there is no seam between the bodice and skirt portions. I love this because a lovely border print can be fully utilized in this design without breaking it up. You can see how this works perfectly with the Echino Japanese linen pictured here. Another great thing about this design? There are only FOUR pattern pieces! I incorporated the facing to be part of the front dress pattern piece, so all you have to do is fold it back. 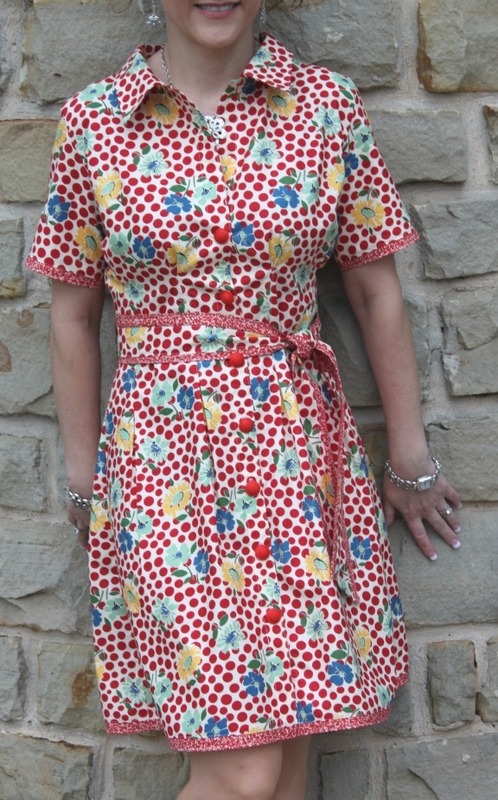 There is no neck facing, either.....which makes this dress super easy to sew together. The pleats at the waist are totally customized to fit when you make the dress, so you take them up as much or little as you want. You can also make them as tall or short as you want, too. Because of this design element, your waist can be a bit out of proportion to the rest of your body on the size chart and still work easily....less is taken in the waist without having to alter the pattern pieces. I think that element alone makes this pattern a real winner! I offer three different cutting lines for the length of the skirt and two lengths for the sleeves. You can choose to wear the dress belted or not. I do include the instructions for the tie belts as well as the fabric covered buckled one. This is a great place to drag out your vintage buttons. All of the dresses featured have vintage buttons. I just love the throw-back look you can get with vintage stuff! A few details about the fabrics: the gray chevron is Riley Blake, the red dot is Moda, the blue floral is Westminster (trimmed with a dot from Michael Miller), and the long floral border print is Echino Japanese linen. Again, this pattern is still at the printer. We anticipate the arrival of stock in about a week now! Enjoy this sneak peek....there will be another reveal on Thursday!